Southland Snapshot: Happy St. Patrick's Day! 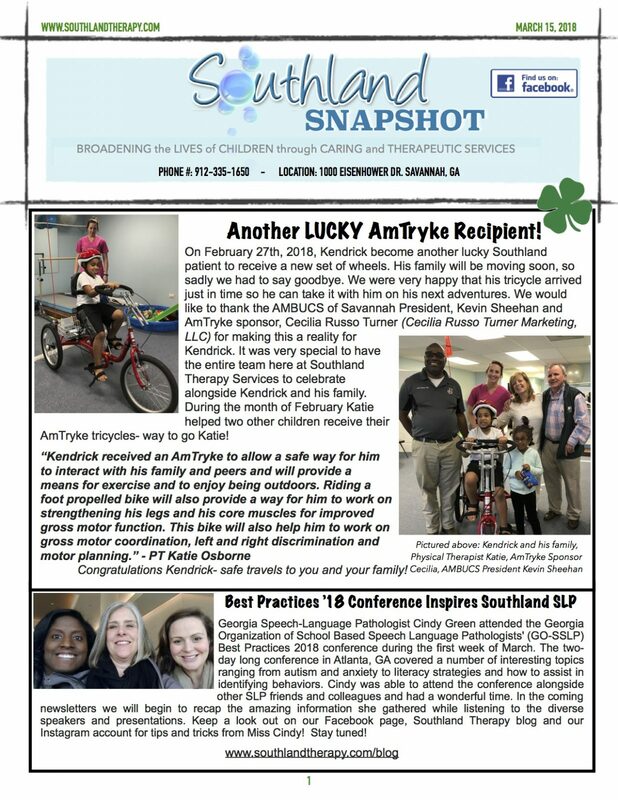 - Southland Therapy Services, Inc.
On February 27th, 2018, Kendrick become another lucky Southland patient to receive a new set of wheels. His family will be moving soon, so sadly we had to say goodbye. We were very happy that his tricycle arrived just in time so he can take it with him on his next adventures. We would like to thank the AMBUCS of Savannah President, Kevin Sheehan and AmTryke sponsor, Cecilia Russo Turner (Cecilia Russo Turner Marketing, LLC) for making this a reality for Kendrick. It was very special to have the entire team here at Southland Therapy Services to celebrate alongside Kendrick and his family. During the month of February Katie helped two other children receive their AmTryke tricycles- way to go Katie! Congratulations Kendrick- safe travels to you and your family! Georgia Speech-Language Pathologist Cindy Green attended the Georgia Organization of School Based Speech Language Pathologists' (GO-SSLP) Best Practices 2018 conference during the first week of March. The two-day long conference in Atlanta, GA covered a number of interesting topics ranging from autism and anxiety to literacy strategies and how to assist in identifying behaviors. Cindy was able to attend the conference alongside other SLP friends and colleagues and had a wonderful time. In the coming newsletters we will begin to recap the amazing information she gathered while listening to the diverse speakers and presentations. Keep a look out on our Facebook page, Southland Therapy blog and our Instagram account for tips and tricks from Miss Cindy! Stay tuned! Anne Marie has worked in the field of pediatric physical therapy for over 35 years after receiving her degree from the University of Buffalo. She has worked in many diverse settings which include: hospital, NICU’s, neonatal follow up clinics, center and Home based early intervention with medically fragile children, special needs and public school settings, and outpatient pediatric clinics. She has worked in many states including New York, Pennsylvania, New Jersey, South Carolina and now Georgia! Anne Marie loves working with children and their families. She has specialized training in adaptive equipment, torticollis, pediatric treadmill training, aquatic therapy and intensive therapy with the Therasuit and Universal Exercise unit. Anne Marie and her husband, Joe, relocated to Beaufort, South Carolina from coastal New Jersey in 2016. She has 3 children, Matthew, Meghan and Daniel, and a 2 year old grandson, Carter. She loves her new life in the Lowcountry and is looking forward to providing services to South Carolina and Georgia families! Ali graduated with her Master’s from Long Island University C.W. Post. She enjoys building a strong rapport with patients. Ali has a hands-on experience in various settings including clinic, hospital, home, and school environments, treating toddlers through adults. Her experience includes evaluating and treating patients with a range of diagnoses, including language delays/disorders, articulation disorders, autism, down syndrome, apraxia, fluency disorders, and dysphagia as well as cognitive and neurological disorders. Ali has a growing interest in providing intervention for infants, recently graduating from Neonatal Intensive Care (NICU), helping to decrease the gap in services post discharge. Her continuing education includes Neonatal therapy which has led to her interest in the specialized area of feeding therapy. Ali was raised in Princeton, NJ. Being a military spouse, she has lived and worked in several areas of the country. In Ali’s spare time, she enjoys being a foodie and exploring great restaurants, bakeries, & coffee shops. In the week leading up to the March 10th playdate, Southland Therapy patients worked hard to make a piece of the rainbow. Busy cutting, gluing, taping and coloring, the patients’ paper pieces, when put altogether, turned into a wonderful paper chain rainbow that now resides in our OT/ PT room for all to enjoy. The Tumble Tykes kids had so much fun walking over the leprechaun gold on the balance beam and swinging in our cloud swing! Keep an eye out for our next Spring themed playdate! Best of the Best of the Coastal Empire - Savannah Morning News! 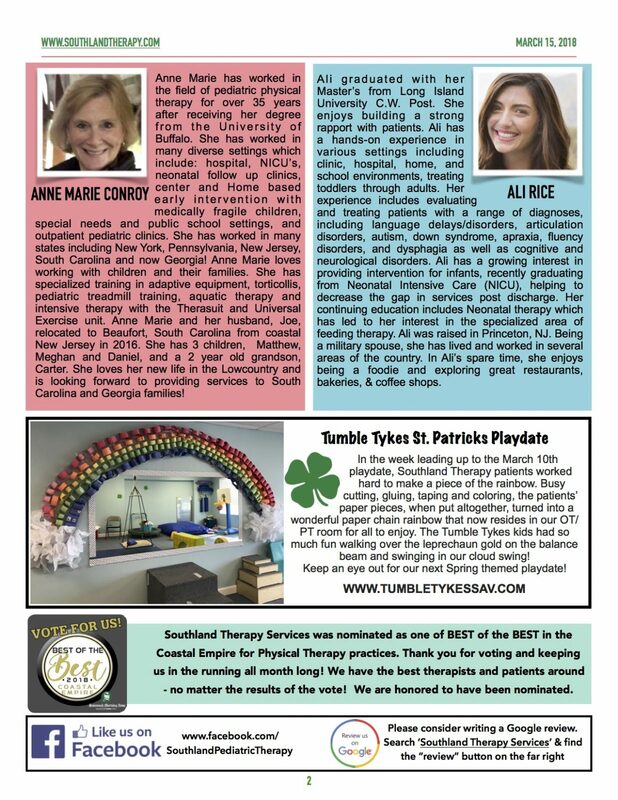 Southland Therapy Services was nominated as one of BEST of the BEST in the Coastal Empire for Physical Therapy practices. Thank you for voting and keeping us in the running all month long! We have the best therapists and patients around - no matter the results of the vote! We are honored to have been nominated.